Microsoft SQL Server comes with a very powerful configuration manager which can be used to manage the SQL Server services and control network visibility and footprint. Working without the SQL Server Configuration Manager is a nightmare for a DBA. Many development environments have SQL Server installed on the developer workstations running a Windows 8 operating system. I have been consulted on a couple of instances where the SQL Server Configuration Manager fails to come up in the “Start” menu application list (even using the Search charm does not yield any results). 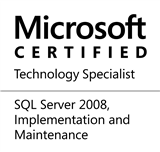 [EDIT, 09/08/2014, 10:55AM IST]: Rectified a typo for the MSC file name related to Configuration Manager for SQL Server 2008 R2. This entry was posted in #SQLServer and tagged #SQLServer, Administration, DBA, HowTo, Installation, Tips on September 1, 2014 by nakulvachhrajani. Thank-you for taking the time out and reading my post. Also, many thanks for pointing out the typo! I stand corrected – I have fixed up the error and updated the post. Once again, many thanks for your valuable feedback!